Since 2015 when I purchased my Designer Diamond Royale, I have been admiring a built in design that I really wanted to use, but was afraid it just wouldn’t turn out to my liking. This week was the week to build up the courage to tackle that project. This is the built in design…. ….and this is the pattern I decided to use. 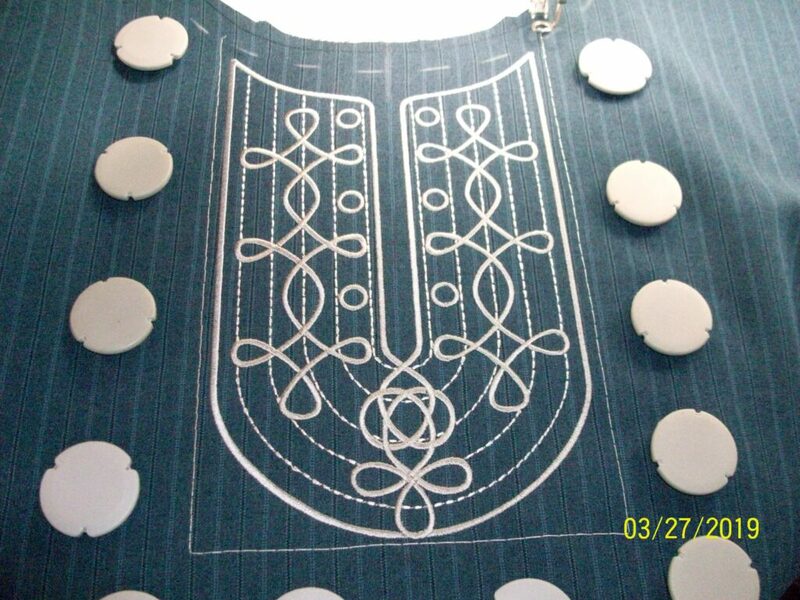 Placement of the design is the most important thing in ensuring success in this type of stitch out. The design used three colors: colors one and two were for the design and color three was to stitch the facing to the tunic’s neckline. 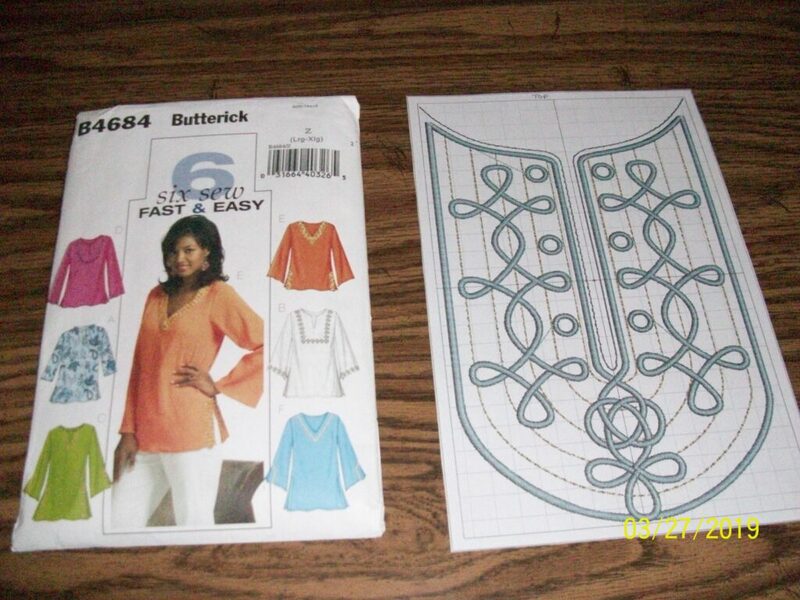 With the pattern chosen for the tunic top, I lined up the neckline of the design with the neckline of the garment’s front pattern piece. 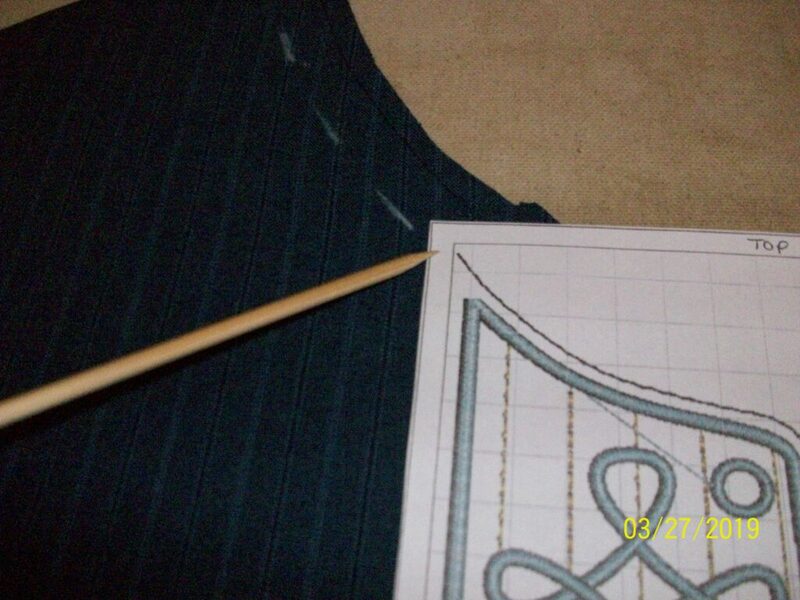 The neckline did not line up exactly so I knew I would need to make some adjustments to the pattern piece since the embroidery design could not be changed. 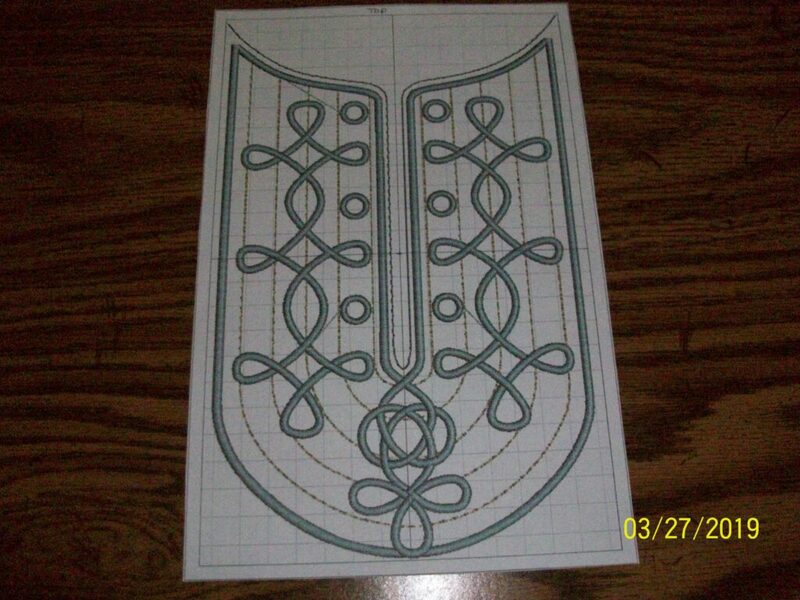 I marked the pattern’s neckline and then lined up the embroidery design so I could taper it in to make an easy transition. 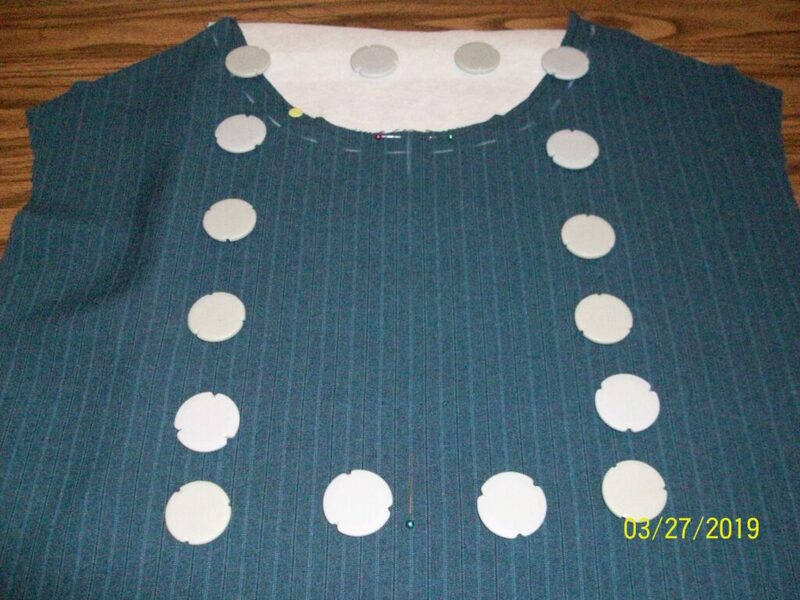 I marked the pattern’s seam line for the front neck…. 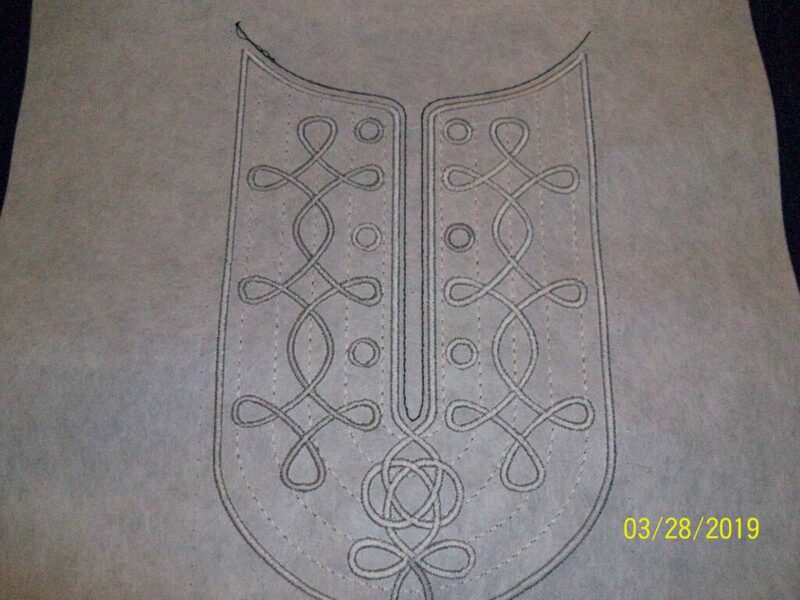 …and lined up the embroidery design with that marking. I knew I would need to make adjustments, so I wanted those adjustments to be as small as possible. 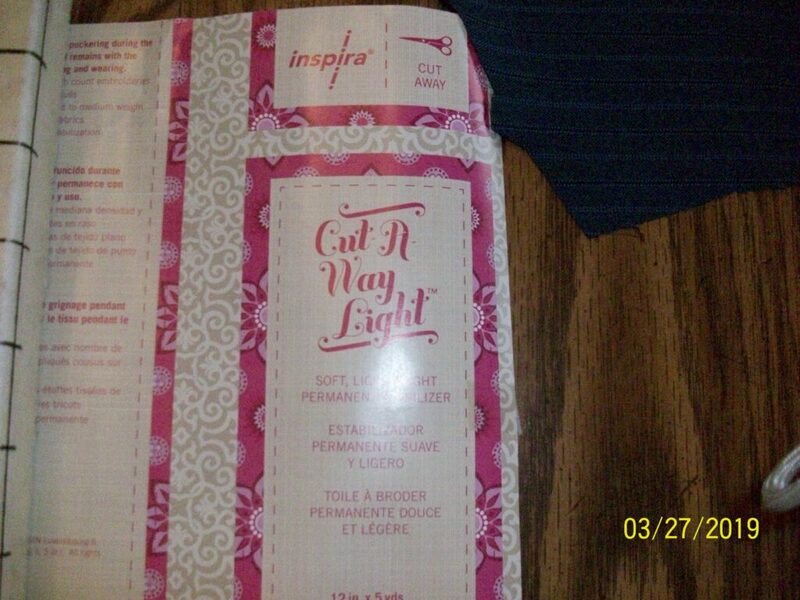 I decided to use a light cut away to stabilize the design. I decided to use my 240 X 150mm metal hoop: my favorite for hard to hoop projects! After completing the first two colors it was time to stitch out color number three, which attached the front facing to the garment. 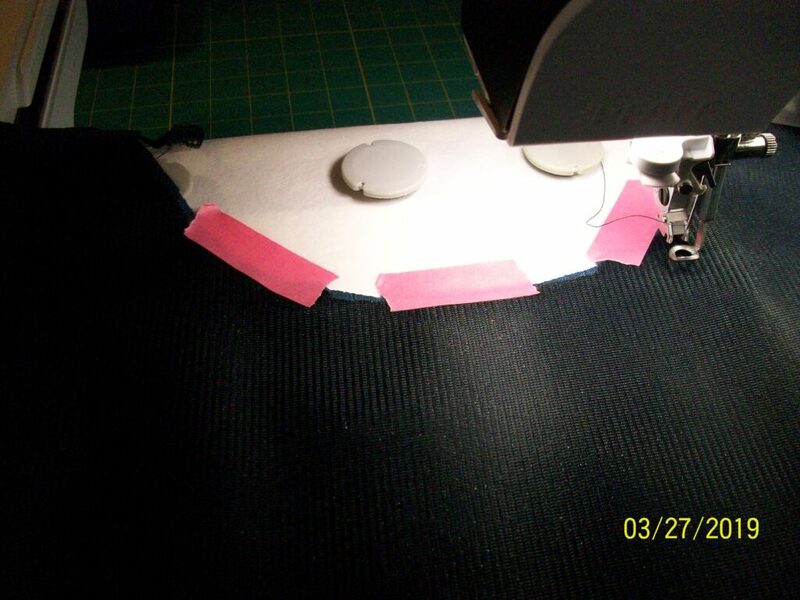 I applied fusible interfacing to the facing piece and placed it over the embroidery design, right sides together…. …and stitched out color number three. The embroidery portion of this project was now done. 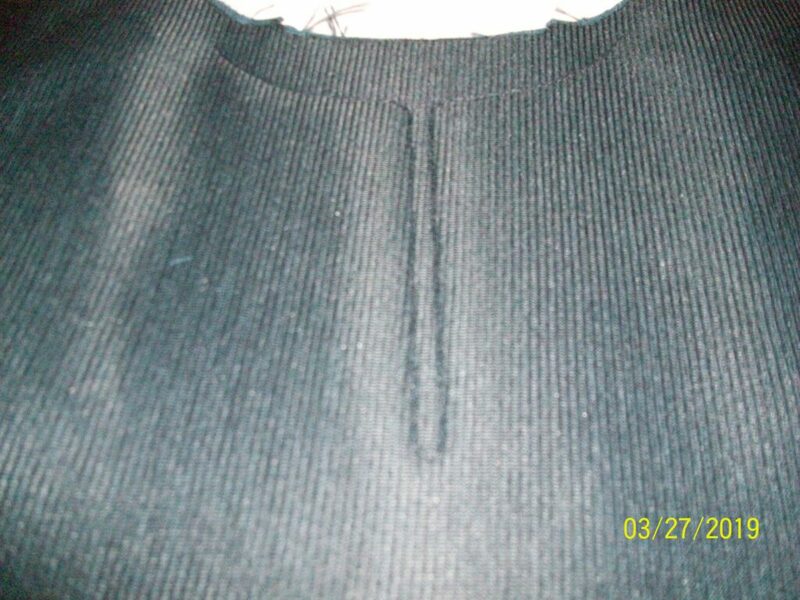 This is how the stitch out looks from the back. 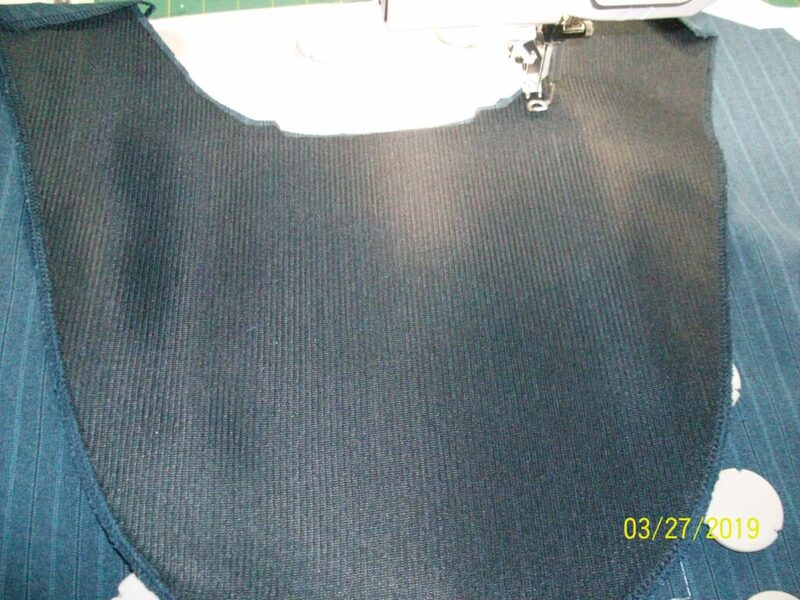 Color number three is the darkest color since that was the thread I was using to construct the rest of the garment. 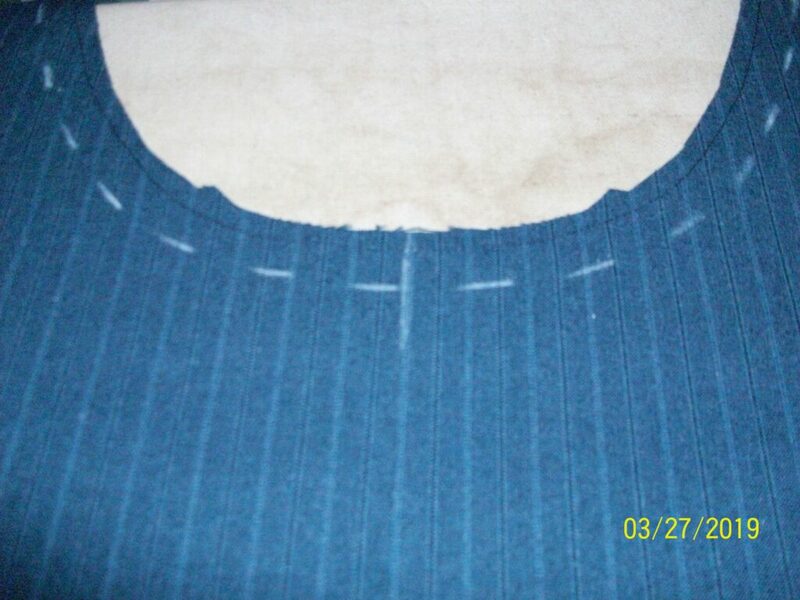 After trimming the cut away stabilizer close to the design, I then tapered the rest of the neckline stitching to meet the embroidery design’s neckline shape and continued with the garment’s construction until finished. 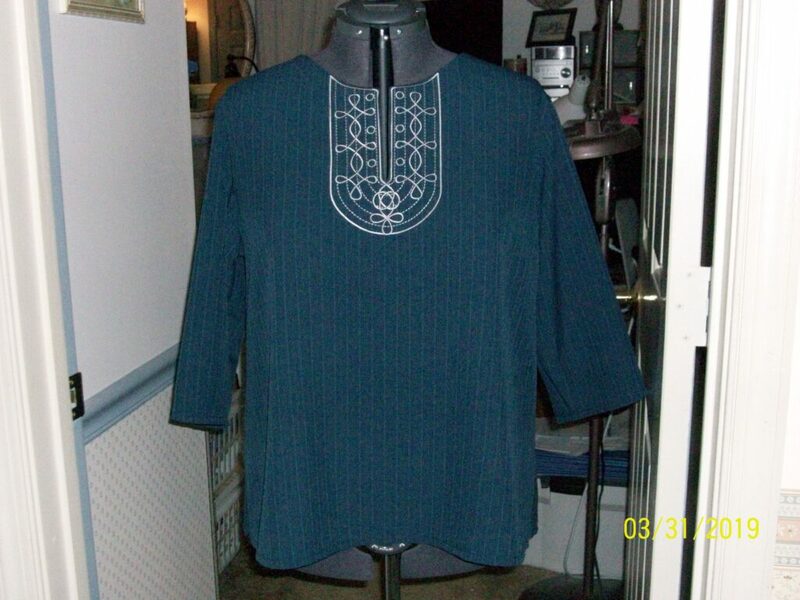 I am very pleased with the finished product and, now that I am filled with confidence, will probably make another tunic with this same design in a different color way. The finished product. There are subtle stripes in the fabric that even line up with the design. An added bonus!